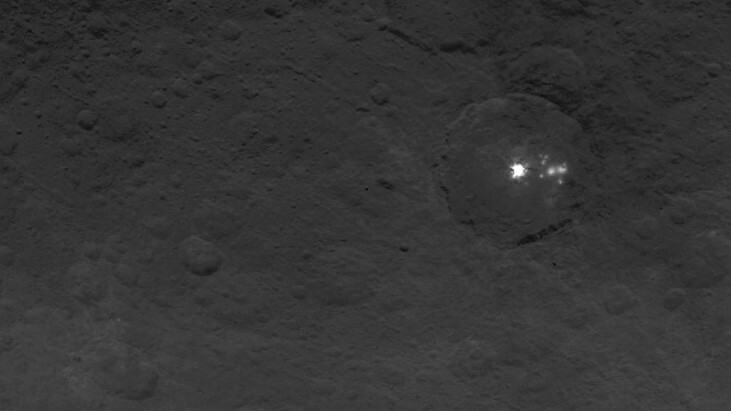 Dawn Survey Orbit Image 11 – Close up and cropped image of the mysterious lights. Official NASA Caption: A cluster of mysterious bright spots on dwarf planet Ceres can be seen in this image, taken by NASA’s Dawn spacecraft from an altitude of 2,700 miles (4,400 kilometers). What are we looking at? 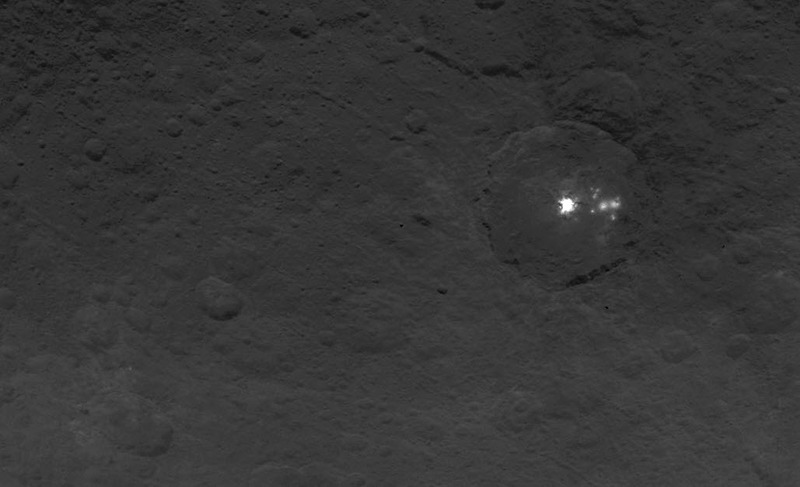 : While taking a photo of the dwarf planet Ceres, NASA’s DAWN spacecraft captured these mysterious and unexplained lights on the surface. 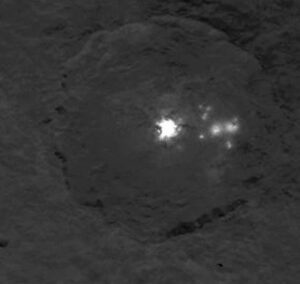 Of course, this could easily be a reflection on ice of something rather mundane, but, NASA scientists have yet to explain whatever it is these lights are. Usually, ice reflections could be somewhat easily proven, however it can not in this case. “The surface of Ceres has revealed many interesting and unique features. For example, icy moons in the outer solar system have craters with central pits, but on Ceres central pits in large craters are much more common. 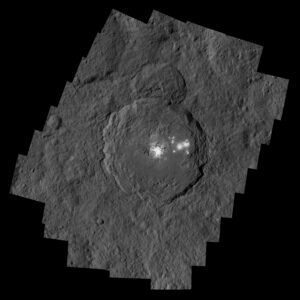 These and other features will allow us to understand the inner structure of Ceres that we cannot sense directly,” said Carol Raymond, deputy principal investigator for the Dawn mission, based at NASA’s Jet Propulsion Laboratory in Pasadena, California. Dawn’s visible and infrared mapping spectrometer allows scientists to identify specific minerals present on Ceres by looking at how light is reflected. Each mineral reflects the range of visible and infrared-light wavelengths in a unique way, and this signature helps scientists determine the components of Ceres. So, as the spacecraft continues to send back more images and data, scientists will learn more about the mystery bright spots. In addition to the bright spots, the latest images also show a mountain with steep slopes protruding from a relatively smooth area of the dwarf planet’s surface. The structure rises about 3 miles (5 kilometers) above the surface. Scientists from NASA’s Dawn mission unveiled new images from the spacecraft’s lowest orbit at Ceres, including highly anticipated views of Occator Crater, at the 47th annual Lunar and Planetary Science Conference in The Woodlands, Texas, on Tuesday. Occator Crater, measuring 57 miles (92 kilometers) across and 2.5 miles (4 kilometers) deep, contains the brightest area on Ceres, the dwarf planet that Dawn has explored since early 2015. The latest images, taken from 240 miles (385 kilometers) above the surface of Ceres, reveal a dome in a smooth-walled pit in the bright center of the crater. Numerous linear features and fractures crisscross the top and flanks of this dome. Prominent fractures also surround the dome and run through smaller, bright regions found within the crater. The team also released an enhanced color map of the surface of Ceres, highlighting the diversity of surface materials and their relationships to surface morphology. Scientists have been studying the shapes of craters and their distribution with great interest. Ceres does not have as many large impact basins as scientists expected, but the number of smaller craters generally matches their predictions. The blue material highlighted in the color map is related to flows, smooth plains and mountains, which appear to be very young surface features. Ceres’ Haulani Crater (21 miles, 34 kilometers wide) is shown in these views from the visible and infrared mapping spectrometer (VIR) aboard NASA’s Dawn spacecraft. Data relevant to the possibility of subsurface ice is also emerging from Dawn’s Gamma Ray and Neutron Detector (GRaND), which began acquiring its primary data set in December. Neutrons and gamma rays produced by cosmic ray interactions with surface materials provide a fingerprint of Ceres’ chemical makeup. 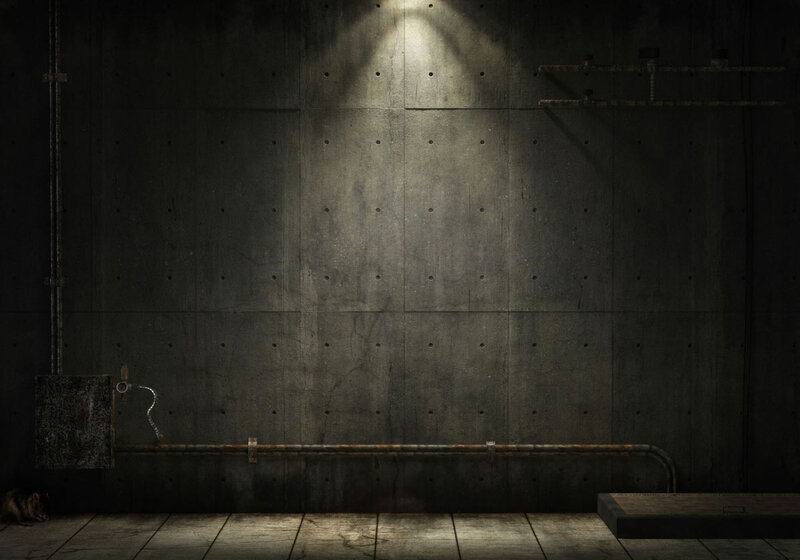 The measurements are sensitive to elemental composition of the topmost yard (meter) of the regolith. In Dawn’s lowest-altitude orbit, the instrument has detected fewer neutrons near the poles of Ceres than at the equator, which indicates increased hydrogen concentration at high latitudes. As hydrogen is a principal constituent of water, water ice could be present close to the surface in polar regions. But the subsurface does not have the same composition all over Ceres, according to data from the visible and infrared mapping spectrometer (VIR), a device that looks at how various wavelengths of sunlight are reflected by the surface, allowing scientists to identify minerals. The bright spots of Occator Crater are shown in enhanced color in this view from NASA’s Dawn spacecraft. 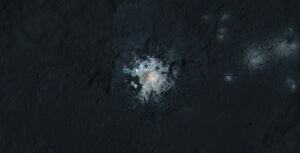 Such views can be used to highlight subtle color differences on Ceres’ surface. Haulani Crater in particular is an intriguing example of how diverse Ceres is in terms of its surface material composition. This irregularly-shaped crater, with its striking bright streaks of material, shows a different proportion of surface materials than its surroundings when viewed with the VIR instrument. While the surface of Ceres is mostly made of a mixture of materials containing carbonates and phyllosilicates, their relative proportion varies across the surface. Dawn scientists also reported in an LPSC scientific session that the VIR instrument has detected water at Oxo Crater, a young, 6-mile-wide (9-kilometer-wide) feature in Ceres’ northern hemisphere. This water could be bound up in minerals or, alternatively, it could take the form of ice. Jean-Philippe Combe of the Bear Fight Institute, Winthrop, Washington, said that this water-bearing material could have been exposed during a landslide or an impact — perhaps even a combination of the two events. 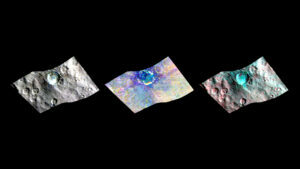 Oxo is the only place on Ceres where water has been detected at the surface so far. Dawn will continue to observe this area. Dawn made history last year as the first mission to reach a dwarf planet, and the first to orbit two distinct extraterrestrial targets — both of them in the main asteroid belt between Mars and Jupiter. The mission conducted extensive observations of Vesta during its 14-month orbit there in 2011-2012. “We’re excited to unveil these beautiful new images, especially Occator, which illustrate the complexity of the processes shaping Ceres’ surface. Now that we can see Ceres’ enigmatic bright spots, surface minerals and morphology in high resolution, we’re busy working to figure out what processes shaped this unique dwarf planet. By comparing Ceres with Vesta, we’ll glean new insights about the early solar system,” said Carol Raymond, deputy principal investigator for the Dawn mission, based at NASA’s Jet Propulsion Laboratory, Pasadena, California. How was this photo taken? : This photo was taken by the DAWN Spacecraft. Dawn delves into the unknown and achieves what’s never been attempted before. A mission in NASA’s Discovery Program, Dawn orbited and explored the giant protoplanet Vesta in 2011-2012, and now it is in orbit and exploring a second new world, dwarf planet Ceres. Dawn’s goal is to characterize the conditions and processes of its earliest history by investigating in detail two of the largest protoplanets remaining intact since their formation. Ceres and Vesta reside in the main asteroid belt, the extensive region between Mars and Jupiter, along with many other smaller bodies. Each followed a very different evolutionary path, constrained by the diversity of processes that operated during the first few million years of solar system evolution. When Dawn visits Ceres and Vesta, the spacecraft steps us back in solar system time. Dawn’s mission to Vesta and Ceres is managed by the Jet Propulsion Laboratory for NASA’s Science Mission Directorate in Washington. Dawn is a project of the directorate’s Discovery Program, managed by NASA’s Marshall Space Flight Center in Huntsville, Alabama. UCLA is responsible for overall Dawn mission science. Orbital ATK, Inc., of Dulles, Virginia, designed and built the spacecraft. 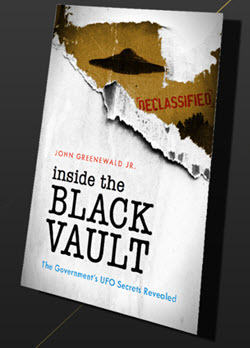 JPL is managed for NASA by the California Institute of Technology in Pasadena. The framing cameras were provided by the Max Planck Institute for Solar System Research, Gottingen, Germany, with significant contributions by the German Aerospace Center (DLR) Institute of Planetary Research, Berlin, and in coordination with the Institute of Computer and Communication Network Engineering, Braunschweig. The visible and infrared mapping spectrometer was funded and coordinated by the Italian Space Agency and built by SELEX ES, with the scientific leadership of the Institute for Space Astrophysics and Planetology, Italian National Institute for Astrophysics, Italy, and is operated by the Institute for Space Astrophysics and Planetology, Rome, Italy. The gamma ray and neutron detector was built by Los Alamos National Laboratory, New Mexico, and is operated by the Planetary Science Institute, Tucson, Arizona.